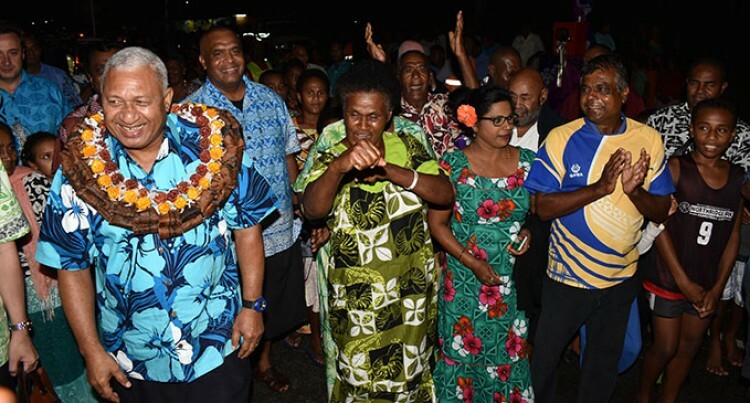 Residents of Cuvu Backroad section in Nadroga, last night rejoiced and danced to the beat of the drums as Prime Minister Voreqe Bainimarama officially switched on 105 street lights in the area. The more than 4000 residents would no longer be walking in the darkness but would be feeling safe and at ease within their hearts and minds. The people thanked the Government and Mr Bainimarama for spearheading the project. Amongst the many people joining the celebrations at the Cuvu College last night, was the 62-year-old, Tui Vusu Ratu Siriako Naciwai, who said the feeling of having brighter nights could not have gotten any better and the presence of the Prime Minister made it even better. “I do live in Biausevu (Komave) and it is great feeling that this project has been done here. This is a highly populated area surrounded with tourists,” he said. Mr Paipo, who had only seen Mr Bainimarama on television arrived at the College finishing off his household chores on time to ensure he was present to see his Prime Minister. He danced merely to the beat of the drums meeting the man behind the rapid growth and development of Fiji. “This is a great thing that Government has done to set up streetlights. “It does change the way we live in a village setting. We are totally blessed,” Mr Paipo said. The project which cost Government around $582,469 was labelled a worthy investment and added safety and convenience to almost 4000 Fijians who call Cuvu their home. The Government has made lighting up of streets and roads and the making of footpaths a major priority. This section of the Western Division Street Light programme extends from Korotogo bypass all the way to Nailaga village in Ba. With regards to the Queens Road from Suva to Sigatoka, the Attorney-General, Aiyaz Sayed-Khaiyum, said site inspections from Navua to Sigatoka had been completed and a detailed design was being currently carried out. 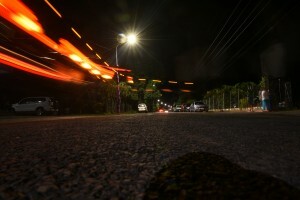 “A well-lit road at night can mean the difference between life and death, difference between a driver being able to see and avoid the passer-by or the tragic loss of loved one,” Mr Sayed-Khaiyum said. He said the lights now encouraged commercial activities at night. “Shops can stay open longer and ladies outside here will be able to sell their fruits and vegetables, even into the night. “People who will sell hot sila or BBQ will now have their customers stopping more readily,” he told residents of the villages and settlements gathered at Cuvu College. He added all new streetlights were being installed with LED light bulbs because it projects the lumen output of the LED more efficiently, which allows for wider coverage of a consistent light pattern. “The Suva to Sigatoka Street lighting project is scheduled to be completed by March 2018 and the areas that will be covered will include Queens Road and inside villages such as Galoa Village (as well as back road), Namatakula, Korolevu, Olosara and Korotogo Village,” Mr Sayed-Khaiyum said. The preliminary cost of this project is estimated to be around $3.5 million. “Installation of street lights along the Kings Road stretch from Nailaga village to Nausori town is also planned with detailed scoping, concept approval and the detailed design of 181 sites currently underway,” Mr Sayed-Khaiyum said. This cost of this project is estimated to be around $3.9 million. The areas without FEA power will be connected once power lines are installed. The installation of streetlights in Vanua Levu from Labasa to Savusavu is also anticipated to be completed by March 2018.